My Canine Kids Sport Pet Sling Carrier is a light weight cross body design made for easily toting your pet around town. 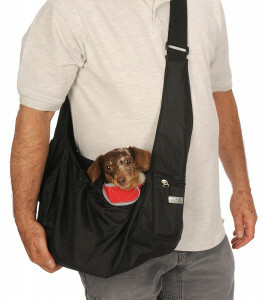 Great hands free carrier with a wide comfort adjustable shoulder strap and clever front drawstring pouch for your pet. Light quilted padding in bottom and flat back adds extra stability. Ships with a zip pocket and open pocket. Waterproof nylon shell and nylon lining. fully washable. Pet Sling Carrier is sized for small pets up to 12 about pounds in weight! Its designed for small and teacup dogs. Sport Sling pouch measures 9 inches deep x 15” wide - body strap measures 20" long to top of pouch when closed, 28" long when fully extended. Constructed of waterproof nylon with a light nylon lining. Light quilted construction on the bottom and flat back for a bit of extra stability. Light weight & fully washable.